CBS News chose the day President Bush launched a series of speeches, intended to boost support for the Iraq war, to highlight a poll which found most Americans are much more pessimistic than is the President. In laying out on Monday's CBS Evening News a series of poll findings, including how 66 percent feel Bush has been describing the “things in Iraq” as “better than they are,” both Bob Schieffer and Jim Axelrod skipped the finding that, while the media fare better than Bush, nearly a third (31 percent) say the media “make things sound worse in Iraq than they really are,” compared to 24 percent who perceive the media are describing things “better than they are” and 35 percent who think journalism on Iraq “accurately” reflects the situation. 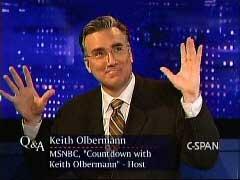 Here's a little more from Brian Lamb's interview with Keith Olbermann on C-SPAN, in particular, more of his denying a liberal bias, lamely vowing he "goes after power," Republican or Democrat, and his explanations for why he has a regular "museum" of VHS tapes of his shows to preserve himself for posterity. 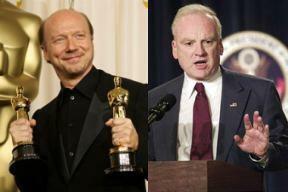 Fresh from winning an Oscar for his movie "Crash," director Paul Haggis is looking to produce and direct a movie based on the memoirs of Richard Clarke, the disgruntled former anti-terrorism official who accuses the Bush Administration of botching the war on terrorism. It's not exactly news to the GOP base that John McCain is not one of them. 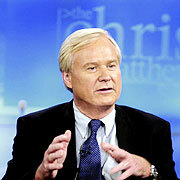 But it was perhaps noteworthy to hear Chris Matthews, ostensibly a McCain man [at least when it comes to his preference among Republican presidential hopefuls], acknowledge that fact on this evening's Hardball. He might also have raised eyebrows on the other side of the aisle by ripping Democrats for their weakness on illegal immigration. Oops! 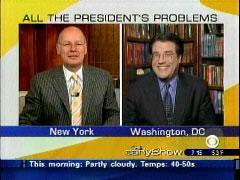 CBS's Harry Smith Says Sen. Brownback Called Himself A "Reagan Democrat"
CBS’s "The Early Show" continued with its practice of bringing in left leaning analysts to explain why things are going so horrendously for President Bush and his Administration. 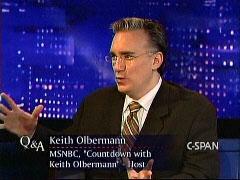 This morning’s guest was Craig Crawford from "Congressional Quarterly." On CNN’s American Morning, U.S. News & World Report Editor-At-Large David Gergen fretted that Republican Senator John McCain may be transforming into a "hard-core conservative" after McCain expressed his support for President Bush at the Southern Republican Leadership Conference in Memphis, Tennessee on March 10. The New York Times Sunday magazine examines Democratic aspirations to take back the House and Senate this year in liberal contributing writer James Traub’s “Party Like It’s 1994.” But 12 years after the fact, the Times and Traub still see the 1994 watershed through the conventional liberal wisdom of the time, as an anti-incumbent blast of anger that didn’t augur a nationwide shift to conservatism. • Died in war zones so we can know what was really happening. Certainly, this should come as no surprise – actor George Clooney is a liberal. Yet, in an era when fewer and fewer people want to admit this in mixed company – with polls showing that the ranks of “declared” liberals have significantly declined in the last decade – it is fascinating to see someone – even a Hollywoodian – so proudly proclaim their leftist affiliation. 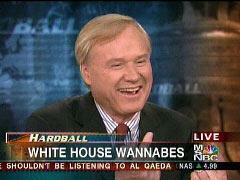 Jack Kelly, national security writer for the Pittsburgh Post-Gazette, writes that journalists who accused Bush of "cherrypicking" the intelligence on Iraq's WMDs "have cherrypicked facts and quotes to give the false impression there is civil war in Iraq."